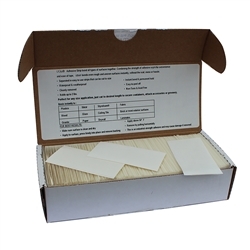 UGlu® 900 Contractor Pack features 20mil rubber based mounting adhesive pack of 250 1"x3" strips. Mounting, bonding, securing, temporary holding and carpet installation. UGlu® is often used in the arts & crafts industry. This product adheres well to all woods and metals. Not recommended for use on plastics (see Pro EHB Series for use on plastics).